Caution - Refer to the Sun blade server documentation to determine whether the Sun blade server module is enabled for sharing storage resources with another Sun blade server module. Caution - The option for sharing a single storage resource should only be used with an Oracle-supported clustering solution. For more information about clustering solutions, see the Sun Blade Storage Module Administration Guide. To share a single storage blade resource (for example, HDD6 in slot 2) currently assigned to a single blade server (for example, in slot 0) with another blade server (for example, in slot 1), click the additional blade server target (for example, in slot 1), then click the storage blade resource (for example, HDD6 in slot 2) that you want to share with this target (for example, in slot 1). To save the allocation modification to the blade storage group, click Save. To continue to save the blade storage group assignment, click OK. The Sun Blade Zone Manager highlights the shared storage resources in pink. 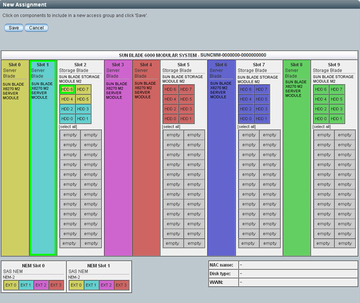 The HDD6 storage resource in slot 2 is highlighted with pink to indicate this resource is shared by more than one CPU blade server. To back up the newly assigned blade storage group, see Backing Up and Recovering SAS-2 Zoning Assignments.